click image for close-up Only two images were ever officially sponsored by England's Abolitionist Society. One was the Society's emblem. The other was this plan of the Liverpool slave ship, the Brookes. Below the plan was a detailed description of the Brookes and information about the ship's trading history. Copies of the plan were distributed widely, including to members of England's Parliament. The illustration showed 482 men, women, and children tightly packed into the Brooke's hold. 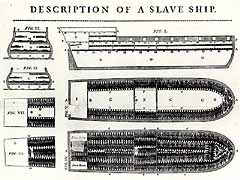 The accompanying description stated that, according to records, as many as 609 slaves had been transported within the same space on the same ship.